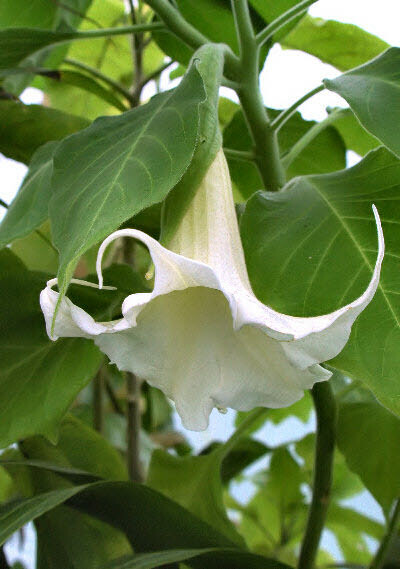 Our Brugmansia seed range is always popular and we are able to offer a valuable range of mixed Hybrid Brugmansia seeds again this year. Feedback from our customers continues to be very positive about the results. Some years ago the classification of the tree type of Datura was moved to Brugmansia leaving the annual and highly poisonous “Thorn Apple” under the Datura classification. Brugmansias originate from South America; a shrubby, tree like plant capable of achieving 30ft in the wild, the genus is highly confusing and it has taken me some time to unscramble the available information. We offer an excellent book on the subject of Brugmansia and Datura if you want to know more about these plants. 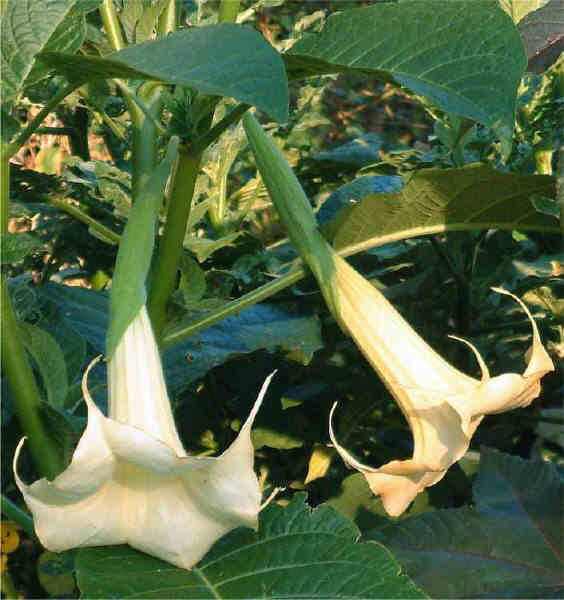 Brugmansia are large shrubs which take some light frosts (-5°C) and, if protected with straw or similar material can tolerate even lower if cut back to a foot or so high and allowed to regrow after winter has passed. Alternatively keep in a cold greenhouse over winter. From my own experience light pruning and not allowing the plants to become pot bound will encourage a more shrubby habit and the plant will flower earlier and more profusely. Plants grown from seed reach 6ft in their first year if sown early and although some will flower in the first year, most will come into flower the following autumn. 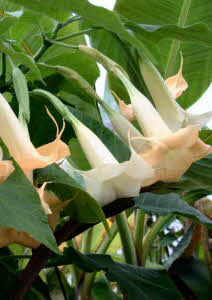 We have available Brugmansia hybrid seed collected from different groups. It will be two years before you know what colour and form you have grown or if single or double flowers - but you may have a new hybrid in your collection! 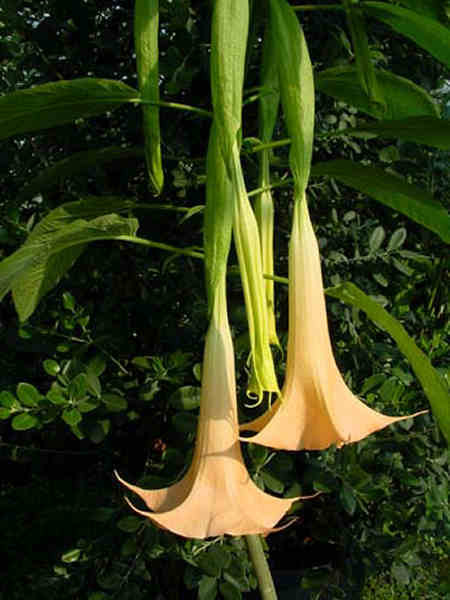 Brugmansia sanguinea is a small 4ft to 12ft shrub from Peru and the Andes with 7" leaves and up to 1ft long flowers that are shaded from yellow to bright orange at the mouth. Easily grown from seed but can take two to three years to flower but maybe I have just been unlucky. Well worth the wait though and in ideal conditions should flower in the second year. Cuttings are hard to take so seed is the best option for this plant. It likes cool conditions and therefore ideally suited to planting outdoors during or relatively cool summers. 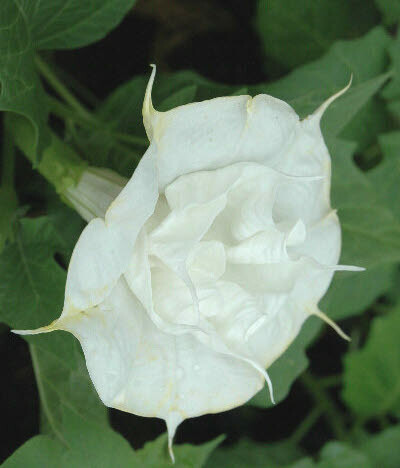 The double forms of the annual Datura Metel are very popular and this one has large 6" double white trumpet flowers with a beautiful scent. 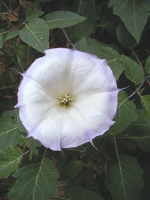 Makes a small shrub of about 3ft in a season if looked after in a rich soil with plenty of water. Needs a warm spot to do well. 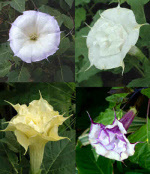 A lovely variety of the annual Datura Metel variety with large 6" double lemon yellow trumpet flowers and a beautiful scent. Makes a small shrub of about 3ft in a season if looked after in a rich soil with plenty of water. Needs a warm spot to be seen at it's best. 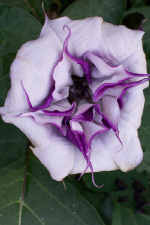 A rare variety of the annual Datura Metel, producing large purple and white 6” trumpet flowers, with a beautiful scent. A stunning variety of this annual Datura Metel with large 6" trumpet flowers of purple and white with a beautiful scent. Makes a small shrub of about 3ft in a season if looked after in a rich soil with plenty of water. Needs a warm spot to do well.